An EPUK appeal to help the families of a photographer and journalist killed in South Ossetia this year raised over £1300. Families and colleagues send thanks as donation arrives. EPUK’s appeal to raise money to help the families of photographer Sasha Klimchuk and journalist Giga Chikhladze killed in South Ossetia in August raised a record £1330. The money was wired to Tbilisi, Georgia last week and was shared equally between the parents of Sasha Klimchuk and Natalia Mumladze, the wife of Giga Chikladze and the mother of his two small children. 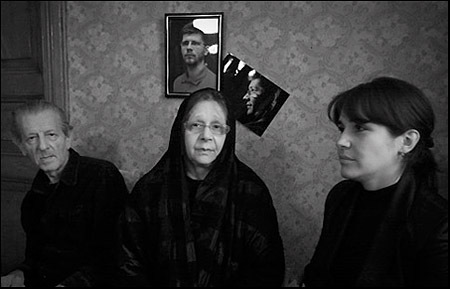 The families were dependent on incomes from Sasha’s photography and from Giga’s journalism. The generosity of EPUK members means the families can begin to rebuild their lives after the tragedy. Friends Sasha and Giga vowed to look after each other’s family should one of them die but both were shot and killed in the same incident by gunmen in Tskhinvali, the South Ossetian capital on August 9th 2008. Sasha Klimchuk (27) was head of the independent photo agency Caucasus Images. He was freelancing for the Russian news agency Itar Tass at the time of his death. Giga Chikladze (30) was working for Russian Newsweek. There is little support for the families of killed journalists in the region. Photojournalist Timo Vogt, who created Caucasus Images with Sasha Klimchuk, thanked everyone on EPUK for their effort in supporting the relatives. “It’s a good feeling for Natalia, Julia and Vladimir to receive all this solidarity from all over the world. Thank you so much!” wrote Timo in an email from Tbilisi. Giga’s widow Natalia thanked EPUK not only for the donation but for the list’s understanding and sympathy. It was photojournalist Timo Vogt who alerted EPUK member Mark Pinder to the tragedy. An EPUK appeal was launched, and now the generosity of the EPUK membership has touched the hearts of the bereaved families. Thanks to Timo the Rory Peck Trust which exists to support freelance newsgatherers and their families worldwide in times of need, are also in contact with Sasha’s parents and Giga’s wife, Natalia. Although the agency lives on Sasha’s own dream ended when he and his friend Giga were gunned down on a street in Tskhinvali. 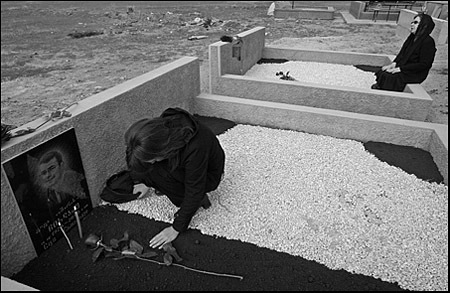 The friends who vowed to look after each other’s families now lie side by side in a Tbilisi graveyard. Sasha’s parents and Giga’s wife and children can begin to rebuild their shattered lives thanks to the generosity of the EPUK membership. • Timo Vogt’s dramatic photographs of South Ossetia can be seen on his Randbild website.